Stevenson Que: GRADUATION PICTURE! So Happy! This is the second time in Cavite Daily Photo that I have featured Yours Truly. 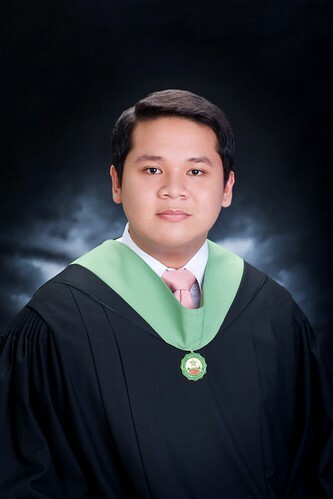 This is it, the moment I have been dreaming all my life, Me on a Black Toga, Graduation Picture. After four long years in the University, I am about to receive my Bachelor's Degree in less than two months. I thank God so much for giving me an opportunity to have parents and grandparents that supported my education from Kindergarten up to College. Also, without all my friends and all the people that believed in me, I will not be able to attain everything that I have right now, including you my fellow Bloggers, you made my College life fun. You gave me a way to get out of everything and immerse myself from scenes you deliver on my desktop! I know this time means goodbye to schooling but I will forever be learning all of the lessons that life is to offer me. I am very proud of what I have accomplished, passed my course with flying colors and not being what a typical college student. Now, I want to extend all my gratitude to each and everyone of you. And I am hoping that you would continue supporting me in my journey of life.